Delaware, the First State. A state summed up no better than by Wayne Campbell in Wayne's World 2: "Wow. I'm in ... Delaware." My first impressions of Delaware when I was younger was, I assume, rather similar to that of most denizens of the Northeast Corridor: the state that charges you a buck to use like two miles of I-95 between Maryland and New Jersey. I had passed through Delaware several times in just that fashion. Whilst making my return trip from Washington in October, 1999, the requirement of this project compelled me to head to Dover to get my capitol picture. After taking my picture in Annapolis, Maryland (very conveniently located between Washington and Dover, I might add), I headed east along Maryland's eastern shore, leading up to the Delaware border. Now, before this, I had never seen Delaware outside of I-95. The excitement of seeing things I had never seen before and exploring uncharted territory was building up, and then, driving east on MD-302, the road was about to turn into DE-11. And then out of the darkness I came across this welcome sign, and I knew I had made it to the home of Caesar Rodney. I got out of my truck and placed my left foot beyond the state line, and then followed with my right foot. And after all this time of finally getting to see the rest of the first state of our beloved union the song I sang in my heart repeated one line. "Wow. I'm in ... Delaware." And who the heck is Caesar Rodney, anyway, and what's he doing on my quarter? Fun Fact: Caesar Rodney was so famous, he was depicted on the reverse of the Delaware quarter on horseback because � true! � no one knows what he looked like! Now, the welcome sign on DE-11 near Hartly is decidedly unimpressive. But this is a back road, so I will not begrudge the State of Delaware this sign. This was not on an Interstate, so I will let this one pass. As for the sign itself, the picture is a little hard to see since it was rather dark at the time. It says "Welcome to Delaware. Small Wonder. The First State. Home of Tax-Free Shopping." 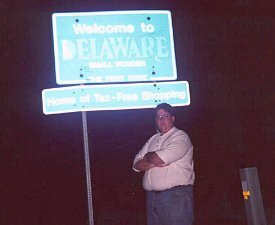 Inside the "D" in "Delaware" is an outline of the state. I then proceeded onto Dover. Although it was dark, what of Delaware I had seen along the way was also unimpressive. Tiny one-horse towns, trailer homes, crabgrass-and-sand lawns, motorcycles, pickup trucks. Maybe the reason this was the first state is that they were in such a hurry to get their minds off the fact that they lived in Delaware. After a while I finally arrived in Dover. Delaware is one of only five states ( along with Alaska, South Dakota, Nevada, and Missouri) whose capital has no access to an Interstate highway. Hell, even Honolulu, Hawaii, has an Interstate highway! Dover's main highways are US-13, which is a 6-lane main thoroughfare in town and then controlled-access to the north; and DE-1, which is a limited-access tollway (50�) whose exit numbers are based on mileage and whose mileage is based on kilometers. Coming from such a bastion of urban and suburban sprawl as Long Island and central New Jersey, Dover is basically a decent sized town. It is unspectacular in terms of its city-like atmosphere (or lack thereof) and would disappear into the woodwork in any more populous state. But this is only Delaware, after all, and we must consider things relative to a Delawarian perspective. Anyway, Delaware has one of those what I call non-traditional state capitols; non-traditional meaning of a style not reminiscent of the U.S. Capitol, featuring a grand rotunda. I am not an architect, but "non-traditional state capitol" is a term I just made up, so please send all royalties to my New Jersey address. 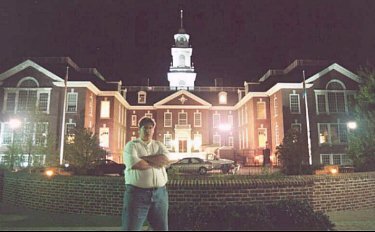 Let's see, what to make of Delaware's state capitol? I really love colonial-style architecture, but I really wasn't expecting it in a statehouse. Delaware's capitol reminds me of some public library on the north shore of Long Island, some Coast Guard station in New England, or something like that. It's a fairly small building. The capitol grounds have a west and east entrance, and then you go around a traffic circle, in the middle of which is the capitol. All of the bigshots in the legislature have their parking spaces clearly marked right out front. No parking garage here! So then I left, headed north on US-13 and then DE-1. Within a few minutes, all the lights of Delaware's capital town had faded into the Delmarva Peninsula night. Ok, I feel hard-pressed to say something nice about Delaware. Well, there's a pretty cool cable-stayed bridge over the Delaware-Chesapeake Canal, and Wilmington looks like a pretty decent-sized city from what I could tell driving north on I-95 towards Pennsylvania. Handy tip: When you're trying to name all 50 states and there are only 49 on your list, you probably forgot Delaware. This page loaded in 2.555 milliseconds.